Nickelodeon Asia and the Singapore Festival of Fun have announced the aweslime news that, following the tremendous success of the first two Nickelodeon Fiesta's, Nickelodeon Fiesta is back bigger than ever in 2019! Nickelodeon will be serving Nicksters up a fabulous carnival of playful adventures at Nickelodeon Fiesta 2019, a FREE two day event being held over Saturday 23rd and Sunday 24th March 2019, as part of the 2019 Singapore Festival Of Fun! Fans can immerse yourself in the world of Nickelodeon favourites PAW Patrol, SpongeBob SquarePants and the Teenage Mutant Ninja Turtles. Admission is free for everyone and to top that off, Nicksters will get to meet and greet their most-loved Nickelodeon characters in real life, yes, you read it right – real life! Furthermore, fans and their families can discover the historic story of how the trading port Clarke Quay used to be through fun and games. Fans can photograph these special moments with the characters and collect limited edition toys and memorabilia at the festival too! Launch yourself into a fabulous carnival of adventures! Play at the game booths featuring themes from the biggest Nickelodeon shows, where you can get a feel of nostalgic trades like street cobblers, kacang puteh sellers or traditional bakers, and also stand to redeem limited edition Nickelodeon goodie bags*! Journey on the first ever Nickelodeon Fiesta River Cruise** and get to know Singapore like never before. An experience you definitely don't want to miss! Create your own Nickelodeon masterpieces*** - paint your own lantern, create flower garlands, and more! Unleash your imagination and get to bring home your creations! **Limited scheduled times – free registration at Nickelodeon Fiesta River Cruise booth required. ***Limited scheduled times – free registration at Art & Craft Workshop booth required. To celebrate this years Nickelodeon Fiesta, Nick Asia has launched a exclusive competition in which one family can win a trip to Nickelodeon Fiesta 2019! Visit https://www.nickelodeonasia.com/fiesta for more information and to enter! The contest closes March 2, 2019 at 11:59pm, Singapore Time. Presented by Clarke Quay, event organizer Magic Rock will bring the third annual Singapore Festival of Fun to Clarke Quay between Thursday 14th - Sunday 24th March 2019 to entertain Singapore residents and tourists of all ages through a raft of programming segments, including Nickelodeon Fiesta 2019, Magners International Comedy Festival, and Street Fest. Full details about this years Singapore Festival of Fun can be found online at http://festivaloffun.sg, as on Singapore Festival of Fun's official Facebook and Instagram pages. Nickelodeon is a supporting partner of Singapore Festival of Fun 2018. With the upcoming Singapore Festival of Fun, the island state is going to take adventure, dining and entertainment to a whole new level, and your whole family is invited to join in the fun! Every March, Clarke Quay offers interactive fun for the whole family with the three-in-one Singapore Festival of Fun. The 10-day extravaganza consists of children’s fair, festival of street performers and a string of comedy shows that will leave you loving Singapore even more. From 8 – 18 March, experience Clarke Quay – the once bustling port that has transformed itself into an upbeat lifestyle district – become a place that offers the young and the young at heart thrilling experiences and much. Start your fun adventure with a good laugh out loud session, at Magners International Comedy Festival Singapore (8 – 11 Mar). Listen to no-holds-barred jokes of decorated international comedians, with headline acts like American comedian, Dough Stanhope, UK’s Best Newcomer to Comedy of 2016, Yuriko Kotani, and Hong Kong’s 2014 Comedy Competition winner, Jim Brewsky. Singapore’s homegrown comedians will also take the spotlight, giving you more reason to laugh your heads off. All of these hilariously funny comedians will be taking comedy a notch higher and you will probably still be laughing days after!. Continue the family fun at Nickelodeon Fiesta (10 & 11 Mar) and immerse yourself in the world of PAW Patrol, SpongeBob SquarePants and the Teenage Mutant Ninja Turtles. Admission is free for everyone and to top that off, meet your most-loved cartoon characters in real life, yes, you read it right – real life. Furthermore, you and your family can discover the historic story of the trading port Clarke Quay used to be through fun and games. You can photograph these special moments with the characters and collect limited edition toys and memorabilia at the festival too. And if you’re looking to something more bizarre, witness the incredible street performers from London’s Covent Garden live at the Street Fest (13 – 18 Mar). Catch the contortionist, Bendy Em, as well as some of the world’s most peculiarly amazing daredevils, gymnasts and jugglers like Pancho Libre, Jump Stilts Extreme and Circus Sonas with stunts never seen before in Singapore! Their unmissable acts will be leaving you in awe and fascination, excited for the next Singapore Festival of Fun. With so many fun activities at Clarke Quay for your whole family, don’t wait any longer to get your tickets for the Singapore Festival of Fun! Visit: https://www.visitsingapore.com/festivals-events-singapore/annual-highlights/singapore-festival-of-fun/ for more details. Good things come in threes and the third edition of Nickelodeon Fiesta held on 23rd and 24th March, promises to be a fabulous carnival of adventures! 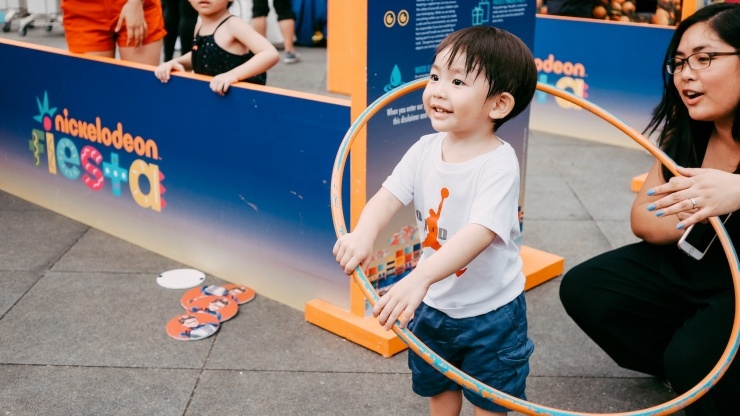 The two-day free event at Clarke Quay will feature playful Nickelodeon activities that are inspired by Singapore’s rich history and traditional trades. Look forward to game booths and activities with themes from the biggest Nickelodeon shows, where kids and families can get a feel of local nostalgic trades such as street cobblers, the kacang puteh man, ice cream seller or the traditional baker, and also stand a chance to take home Nickelodeon collectibles. Not to be missed too are the stage games and photo opportunities with family favourite characters from shows like SpongeBob SquarePants, Rise of the Teenage Mutant Ninja Turtles, PAW Patrol and Dora the Explorer! Fans from the region who wish to attend Nickelodeon Fiesta, look out for a contest from 10 February on nick-asia.com, where you can win a trip to Singapore to experience Nickelodeon Fiesta 2019! Take selfies with your favorite Nickelodeon characters, play stage games and win prizes! Journey on the first ever Nickelodeon Fiesta River Cruise** and get to know Singapore like never before. Create your own Nickelodeon masterpieces** - paint your own lantern, create flower garlands, and more! Unleash your imagination and get to bring home your creations! More Nick: Nickelodeon Launches Academic Animation Program in China! Follow NickALive! on Twitter, Tumblr, Reddit, via RSS, on Instagram, and/or Facebook for all the latest Nickelodeon News and Highlights!